Ah, romantic Madrid. 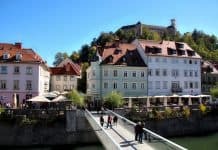 One of the oldest and most charming cities on the planet. This place showcases load of options of where to stay in Madrid, a wonderful architecture, a plethora of stunning floral and green spaces and lays out a true emphasis on food and wine. 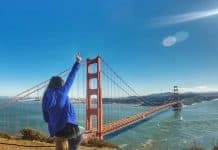 There are also many amazing day trips from Madrid. We are free to say that Madrid may just be one of Europe’s most romantic capitals. Imagine yourself strolling hand-in-hand with your loved one, admiring all of the city’s beautiful monuments and streets – the wandering itself promises to definitely inspire “amor”. 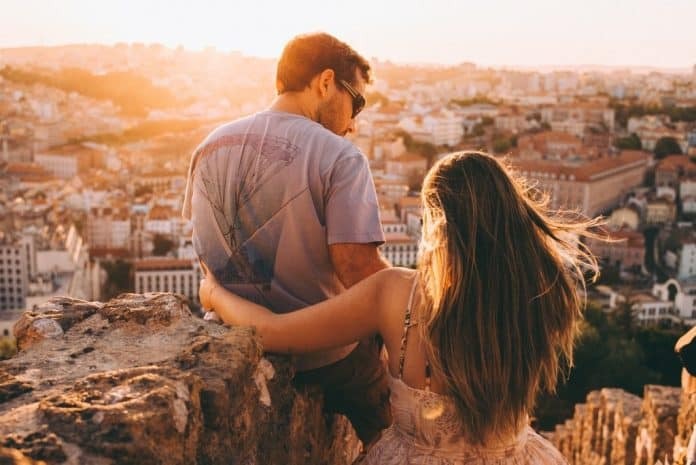 So if you are planning a travel to Spain with your partner, we are here to help you plan your trip with many romantic things to do in Madrid. Here’s a list of the most suitable activities to make this your most idyllic trip ever. 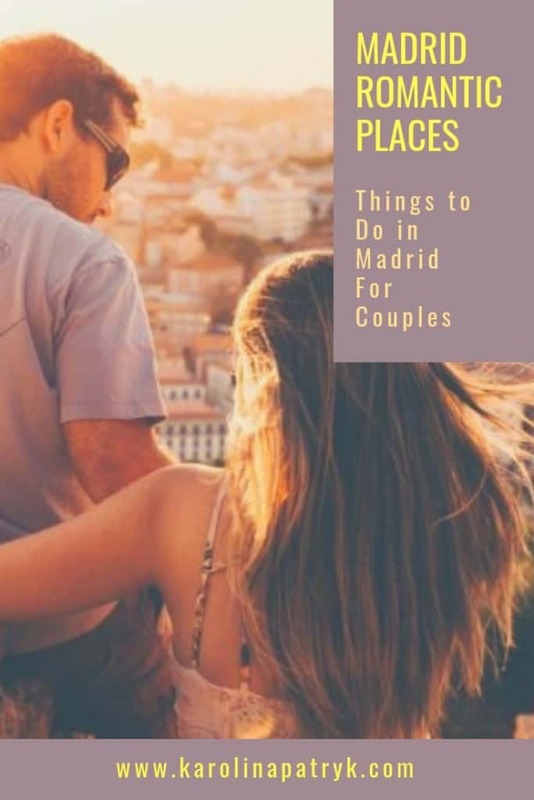 And if you are planning to pop the question during your stay in Spain, a day trip to Madrid can complete this agenda just as well. The royal parks and gardens of Madrid definitely inspire enjoyment and love. Wander through the Retiro Park on a sunny day and get a cup of coffee and Madrid breakfast among the greenery. Go for a walk through the Palacio de Cristal, a building made entirely of glass and get some amazing photos together. Or, for just a couple euros, you can visit Madrid’s Botanical Gardens. If you can opt your visit in spring, you’ll be amazed how pretty the gardens are, with blooming lilies and tulips which seem to stretch on for miles. The bonsai tree garden is another interesting and unusual exhibit that you can visit during any season and admire different bonsai trees from around the world. 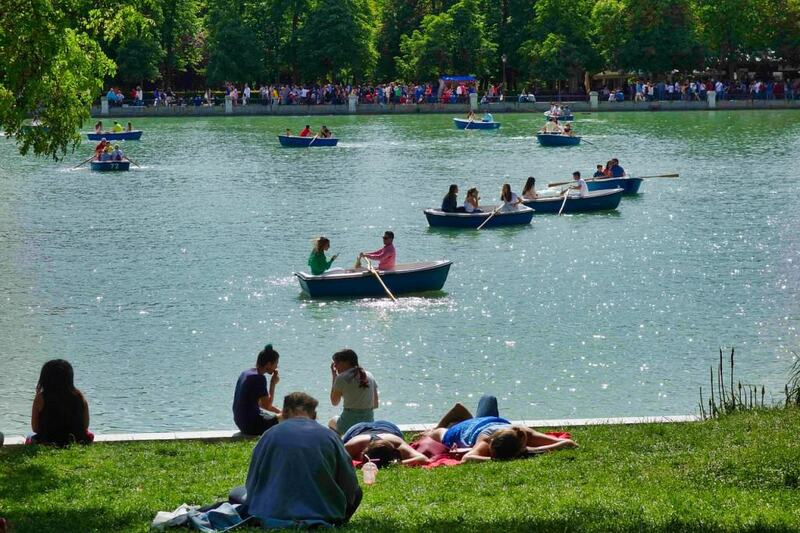 Retiro Park is the most popular park in Madrid, with a huge pond, the Crystal Palace, and plenty of natural views, making it a perfect spot for a romantic afternoon. Take advantage of its beautiful scenery and tranquility and opt for a picnic with wine and tasty local food. You can also enjoy a mouthwatering dessert in a rented boat, or feed the ducks and fish some bread as you row along. 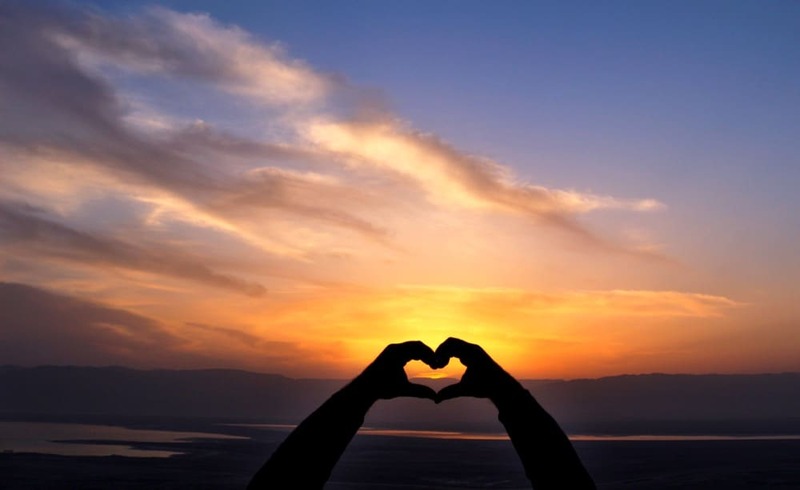 This is a remarkable experience which should be shared with your loved one. 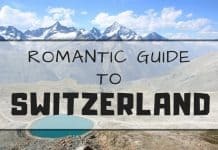 Even though the park is pretty huge and famous, it also has some hidden romantic spots. The entrance to the park is free and renting a boat is just a few euros (prices on weekends are slightly higher) for a whole hour. 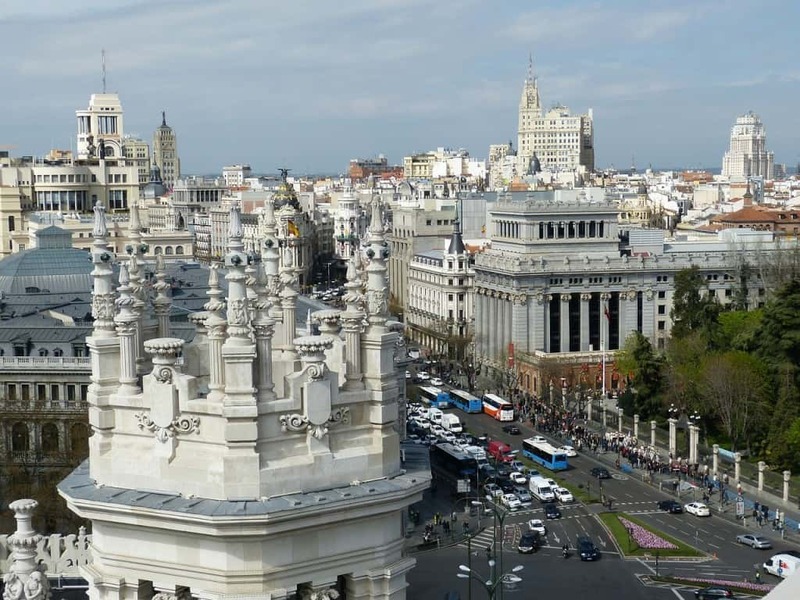 Madrid is widely famous for some of the most beautiful boulevards and avenues. The Paseo del Prado’s tree-lined walkways for example are perfect for a morning stroll right after Madrid breakfast. Malasaña’s tiny cobblestone streets, lined with pretty unique boutiques, many coffee shops and delicious tapas bars are perfect for exploring new spots. 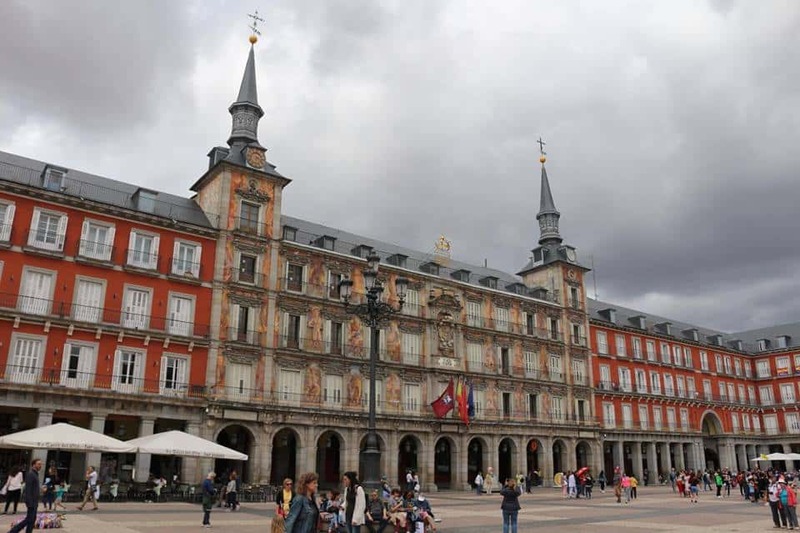 We even recommend sitting on a bench in any of Madrid’s astonishing plazas, such as the Plaza Olavide or the Plaza España. You can have a drink, grab a snack and people-watch or talk – a perfect way to spend an afternoon with your loved one. Among Madrid’s unique experiences, we recommend visiting some of the best rooftop bars Madrid and plazas from where you can see the sunset in Madrid. We promise you that seeing one with your special person will make you fall in love all over again. Admire the fiery orange and pink hues as the sun goes down from the Templo de Debod or the Círculo de Bellas Artes, as the fire in your own relationship goes wilder. Even if you’re on a day trip to Madrid do not miss this opportunity. Madrid is famous for its tasty cuisine, so getting a brunch and tasting a few dishes is a good way to spend an afternoon. While there are plenty of brunch options, El Arquibar for example features just a few tables with rustic décor, being one of the best spots in the city for couples, thanks to their cake trays and fruit platters to share. Best brunch Madrid is served here. 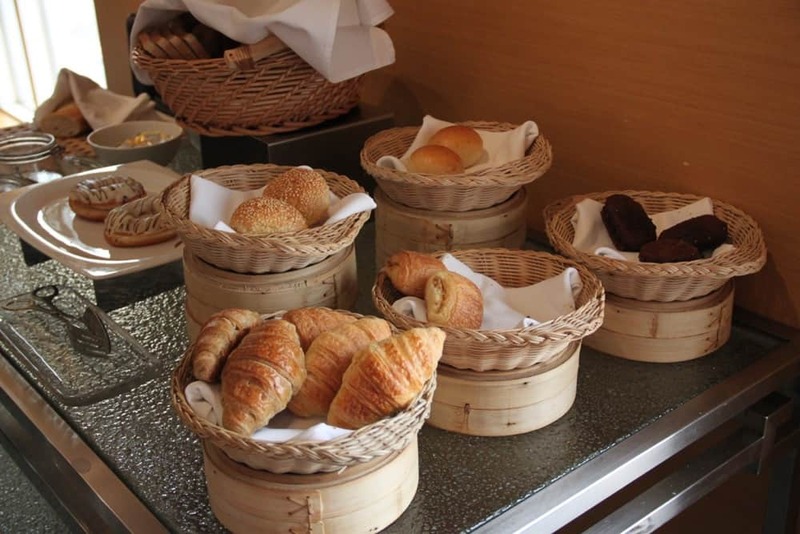 However, if you want a dose of pampering, the Westin Palace Hotel offers brunch with a romantic opera music every Sunday. This buffet-style brunch has a plethora of quality savory meats and cheeses, eggs, salmon, fruits and pastries to fuel your afternoon chat. Plan a passionate day trip from Madrid, as this is a great way for couples to escape the urban jungle. Segovia for example is less than an hour away. Here you can see a Roman aqueduct, a 16th century cathedral and a huge castle looking like the Cinderella Castle at Disney World. Chinchón is also less than an hour away, and here you can admire the wonderful Plaza Mayor, with 234 balconies overlooking the main square. Most of the balconies are restaurants where you can sit outside and enjoy a meal in this peaceful, relaxing village. 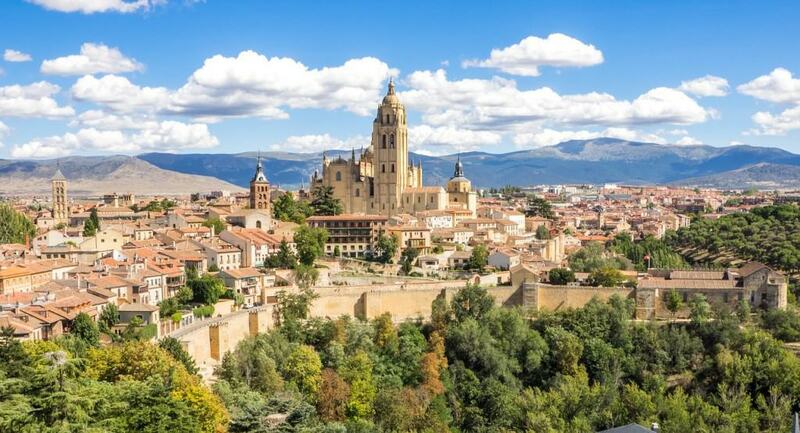 You can reach both towns by a variety of transport options, so plan these day trips from Madrid and pack a few things before you go. It is no secret that Madrid is one of the most famous places for sampling different wines. The intimate La Fisna wine bar in the youthful Lavapiés neighborhood is ideal for a romantic wine tasting, where lovers lounge next to a wall of exposed bricks and wine, as they chat and sip different wines from all over Spain. It is a luxury Madrid side you must experience! Another alternative is the market Platea, basically a former theater with several floors of market stalls and plenty of restaurants and bars where you can enjoy tapas and wine among the crowds. Alternatively, go for a rooftop bar Madrid. Madrid’s renovated river bank offers a romantic walk, or an energetic couple’s bonding bike rides. Even if you are visiting Madrid with toddler or Madrid with children, you still can experience the romantic Madrid. 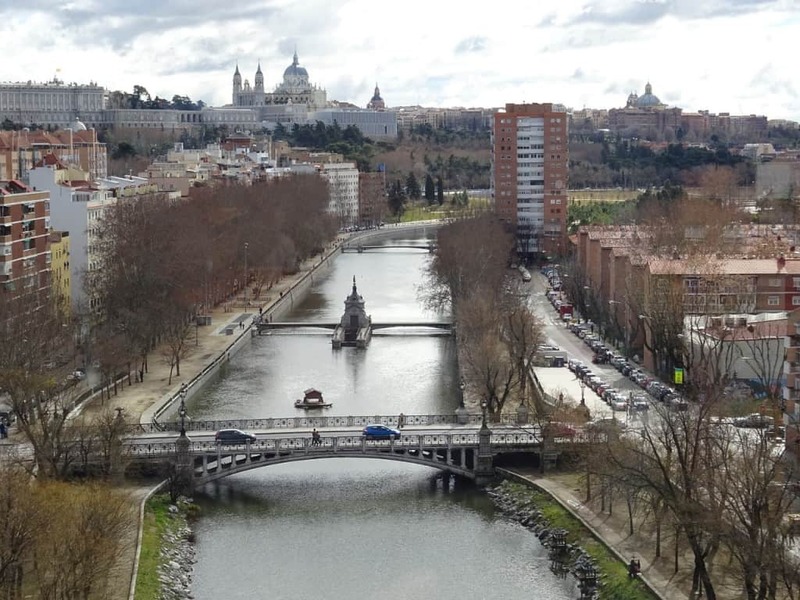 In case you’re looking for a more peaceful experience, simply order a drink along one of the many riverside terraces lining the Manzanares or opt for a Madrid breakfast. If the weather is nice, there’s a sunbathing beach area, where you and your loved one can hang out and simply soak up the sun. You can choose a family hotel Madrid nearby and enjoy such activities every morning. When looking for where to stay in Madrid as a couple, we recommend staying boutique. Madrid has plenty of boutique hotels to choose from, both large and small, guaranteed to serve you the charm and uniqueness you came to seek. 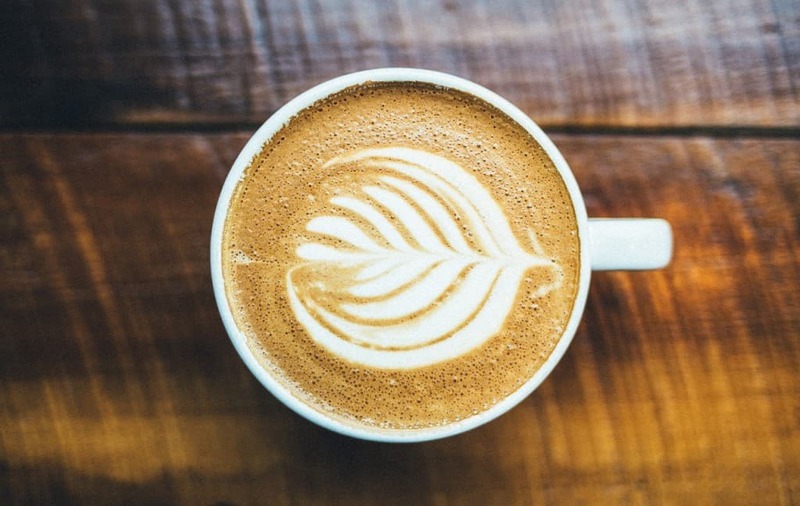 The Dear Hotel for example has rooms with romantic balconies overlooking Gran Via and a rooftop Madrid pool, making it perfect for a morning coffee. You can also choose some of the luxury suites Madrid or romantic hotels in Madrid if you want classier stay. Some of the boutique hotels are a best location to stay in Madrid, so pick wisely. Madrid airport transfer is fairly easy to organize to each of the properties. Get an eleven minute ride – and a bit of an adrenalin rush – over Casa de Campo Park on Madrid’s cableway, where you can spend some alone romantic time and enjoy the view of the Royal Palace, Temple of Debod, Madrid’s River, and the Rosaleda de Madrid (or the Rose garden). If you can plan for this ride close to the sunset, then buckle in for a real treat! The round trip ride costs just a few euros per person, however the experience is truly unforgettable. 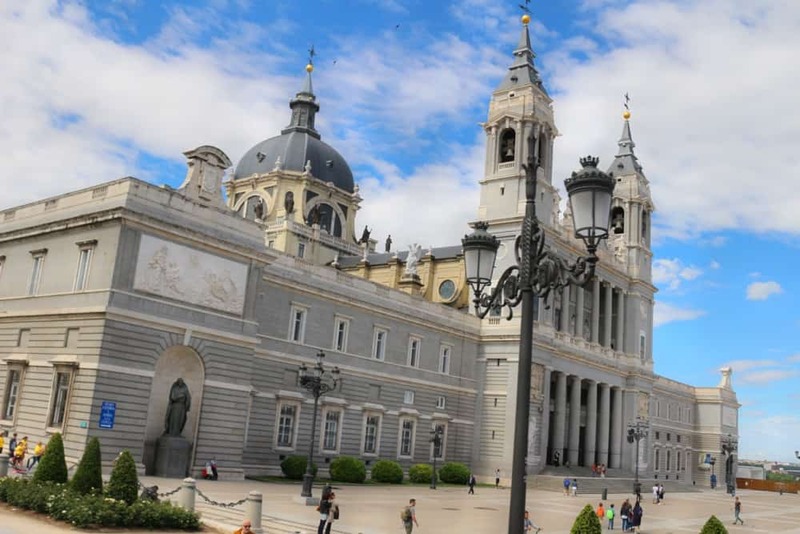 This activity is perfect for everyone on a day trip to Madrid. Theatre date night is perhaps one of the most old-school and charming ways to impress your loved one. Plan an evening at one of Europe’s greatest theaters, Teatro Real (‘The Royal’), a 1,746 people capacity theater which plays host to home productions involving leaders of international performance and dance. Among the Madrid romantic places, this spot may just be the winner. We recommend a trip to the Museum of Romanticism Madrid before seeing a show at Teatro Real for a true cultural experience. There are plenty of spots in Madrid where you can catch a good Flamenco show OR an amazing meal. 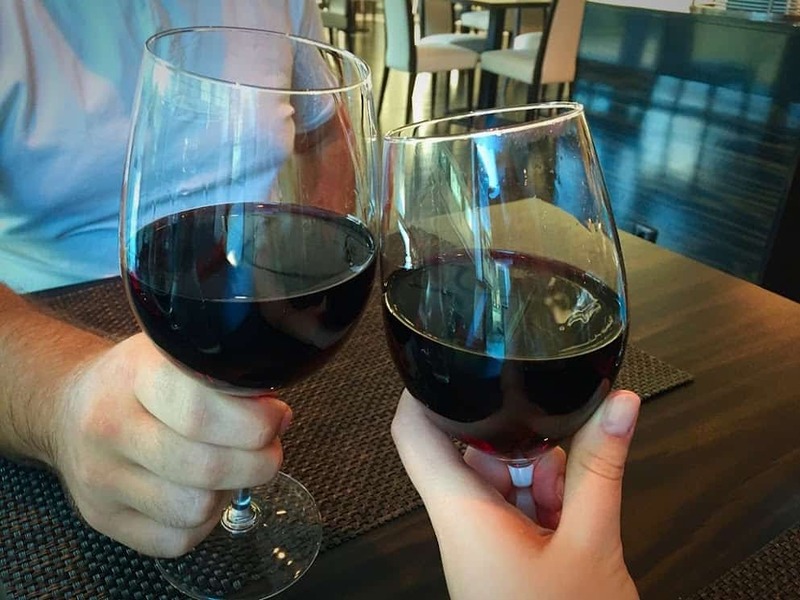 However if you are looking to combine both in one unique experience and translate them into a romantic date, head to Casa Patas. 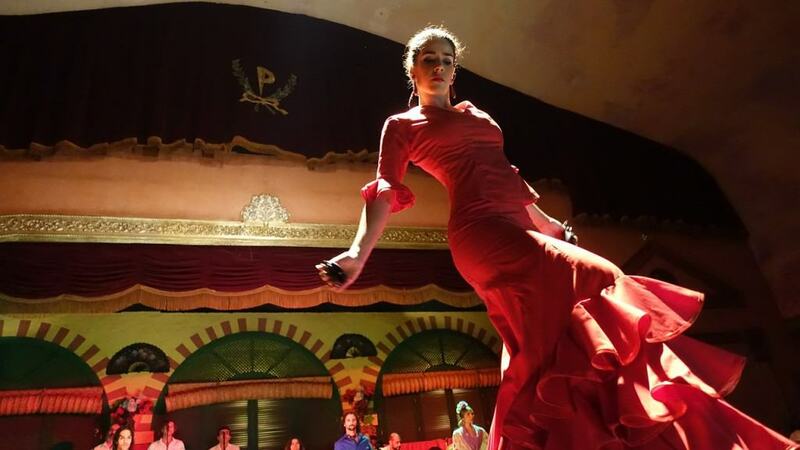 Here you can choose from a classic Madrilenian cuisine and admire the world class Flamenco performance all in an intimate, yet retro setting. Pair this with some of the romantic hotels Madrid and you got yourself a treat. This is an iconic building constructed in 1926, today offering some of the best rooftop Madrid views of the city. This building actually belongs to a multidisciplinary cultural organization with a plethora of activities regarding the visual arts, film, poetry, stage, music, literature, science, philosophy and more. 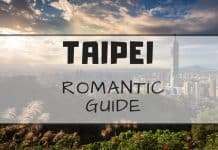 Needless to say, it is a must see spot where you can wrap your arms around your loved one and take deep breaths while enjoying the city from above. 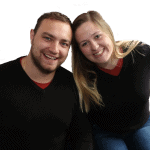 This place offers an intimate setting which is perfect for couples looking for a fun, yet very romantic night out. The menu showcases delicately presented traditional Spanish dishes with a modern twist, paired with a great selection of local wines. So put some fancy clothes on and board the 1950’s themed train car for a trip to the past at this place – one of the most romantic restaurants in Madrid. Among Madrid romantic dining options, make sure to pick this one on your agenda. Madrid has something to offer for every type of visitor. 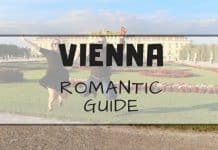 However, having the rich cultural heritage in mind, paired with the amazing parks, Madrid all-inclusive cuisine and wine dining options at the most romantic restaurants Madrid, flora-lined boulevards and stunning architecture, it is pretty easy to plan a romantic getaway for your loved one. Enjoy the breathtaking sunsets from the rooftop Madrid terraces. When considering where to stay in Madrid, book some of the most unique design hotels around the city as best Madrid romantic hotels, or some of the family hotels Madrid if you’re considering where to stay in Madrid with family. Many Madrid family hotels have all you need if you’re visiting Madrid with children. Grab a unique dining experience and a show, plan day trips from Madrid and stroll through the amazing parks. Having all the proposed romantic places in Madrid in mind, we guarantee you a special romantic getaway for this season.